The PAE ROT-20-10 is built with FDA approved materials. The water storage chamber features a virgin polypropylene liner, high-grade chlorobutyl diaphragm and stainless steel 1" BSP water connection. The diaphragm is post-cured to ensure that your water is tasteless, odorless and contaminant free. The tank is built with a sealed brass air valve and o-ring sealed cap to ensure a leak-free air chamber. Certification. The PAE RO-2000 is CE approved and certified to meet NSF standard 58. 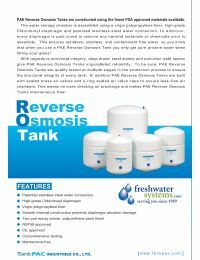 NSF standard 58 was specifically established to provide the minimum requirements for point-of-use (POU) reverse osmosis systems for public or private drinking water. Construction. The PAE RO-2000 is coated steel water storage tank that features a two part epoxy primer and a polyurethane paint finish. This tank uses stainless steel water connections, a high-grade chlorobutyl diaphragm, and a virgin polypropylene liner. Clean and Safe Water. The PAE RO-2000 diaphragm is post-cured to ensure that your water is tasteless, odorless and contaminant free.